There are many email clients, but most lack Exchange support. I have have used Davmail and finally settled with Thunderbird with ExQuilla for some of our users. But reality is that Mozilla discontinued development of Thunderbird and handed the maintenance to community. Thunderbird, truth to be told never really had any vision and didn’t innovate. It still has problems like occasional mail database corruption. For what is worth, the latest version of Thunderbird with ExQuilla for Exchange support works quite well. Problem with various email clients is that even if they have Exchange support for email, they lack support for Calendar and Tasks. 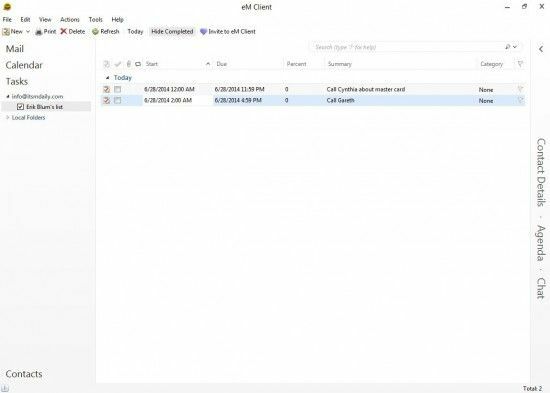 While looking for a better alternative to Outlook with Exchange support I found eM Client. 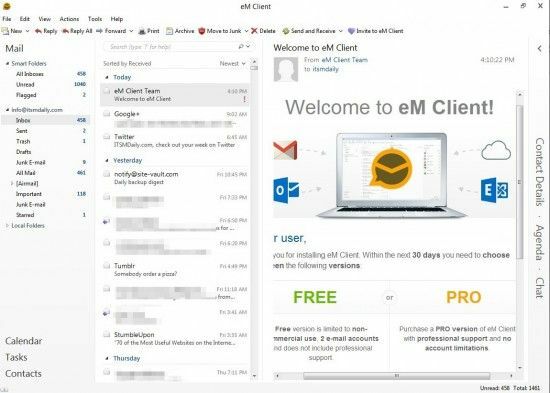 eM Client has a modern look with support for Exchange, Gmail, Office 365, ICloud, Outlook.com, OSX mail server and IceWarp mail server. It works really well. I have replaced Outlook for a week, just to be sure that it’s working well and is suitable for our environment. I was really impressed. I called our internet manager and asked him if he is up for a trial. He loved the idea to have IM client embedded and said let’s go. After 2 days he said he loves eM Client. In addition they also have a Free version. After installation you have an option to set up your account. If you choose Exchange you will be surprised how easy it is to setup your account. If you have ever tested ExQuilla you should know, that experience is quite the opposite. With eM Client enter your name, email address and off you go to your emails. For Chat you have an option to connect with Facebook chat, Google talk or your internal or external Jabber server. 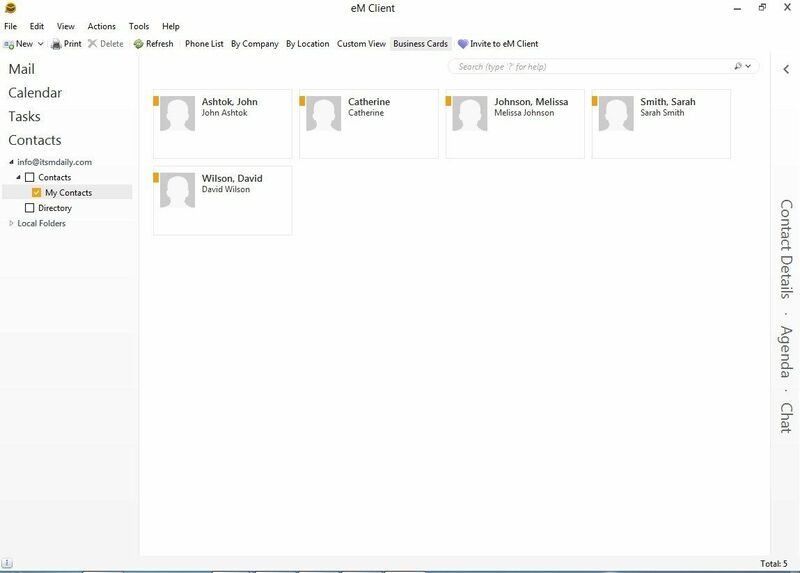 Look is modern, similar to what users are used to with Outlook. You have left pane, middle pane and right pane. 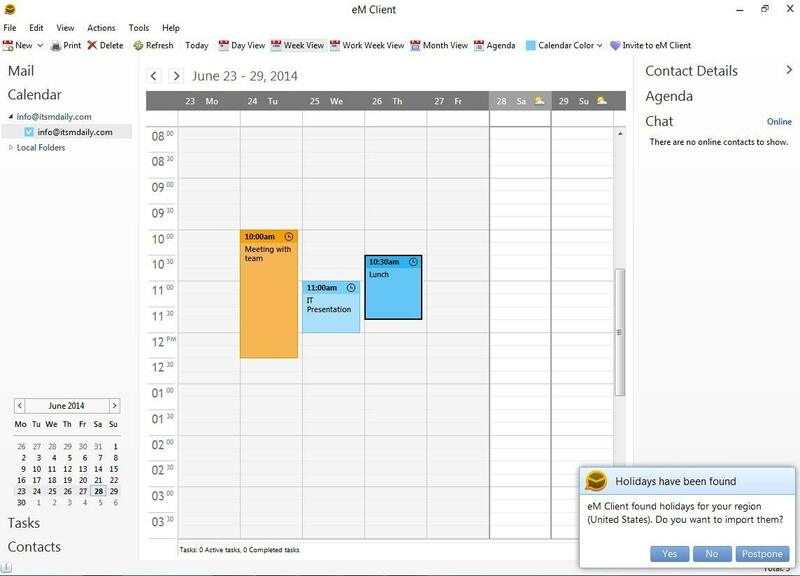 On the left bottom side you have quick links to Calendar, Tasks and Contacts. On the right side you have quick links to Contact Details, Agenda and Chat. Calendar feature is missing in most email clients with Exchange support. Not for eM Client which has support for Exchange Calendar. Available are Day View, Week view, Monthly view and it even shows you weather for upcoming days. It can also import holidays. Splendid. Contacts are synchronised with Exchange. Just like Outlook. Nothing major here, but it has several views you can choose from. Tasks feature is also missing from most of email clients with Exchange support. 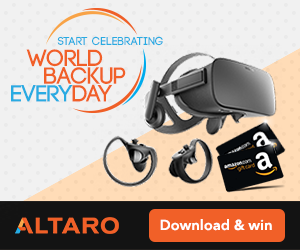 It’s here and you can won’t have to stop using it. 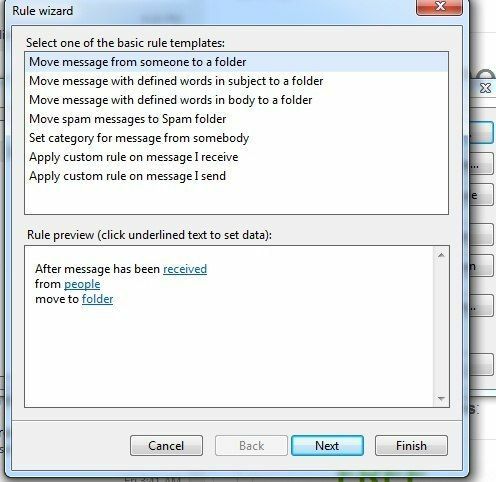 You can set up your own email rules. Sometimes you really need this feature and it’s good that it’s here. I checked with our HelpDesk what is the biggest problem we have with Outlook. The most problems we have with Outlook are with archiving. And it’s because how Outlook performs date analysis. If your email is older than 30 days, auto archiving won’t archive that email if it was accessed in those 30 days. 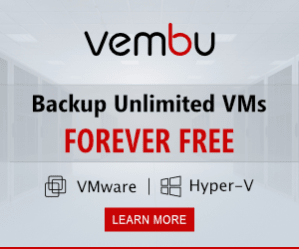 Auto archiving does not work for most users. eM Client has a great solution for archiving. 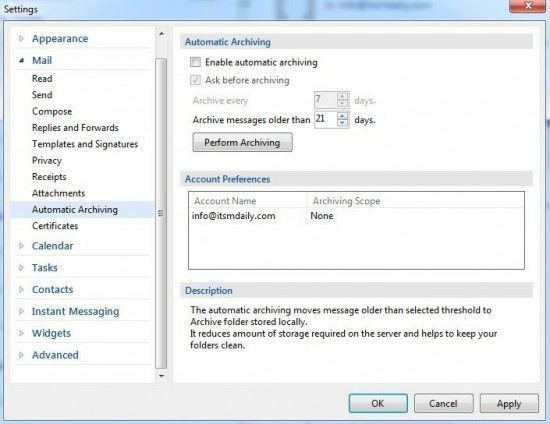 If you enable auto archiving it will archive messages older that X days. And you can also enable automatic archiving. I have been using eM Client for 20 days exclusively. 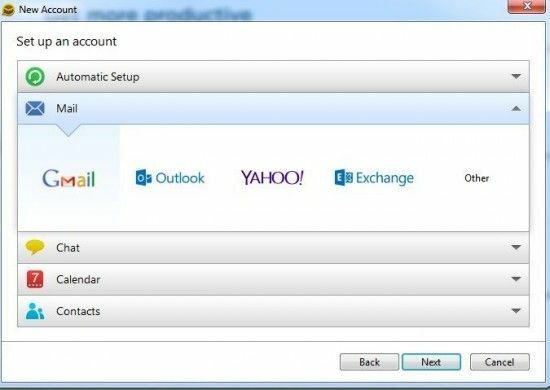 I can see that I can replace Outlook without problems and savings are huge compared to Outlook. Especially if you think that most of the employees could switch over without any problem. 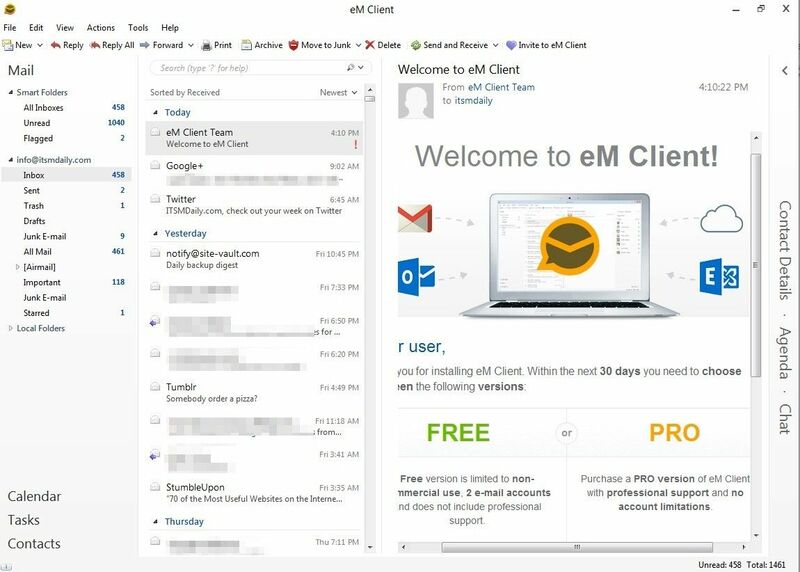 eM Client is available in 2 versions. PRO which has Exchange support and all the features. Price for a PRO version is $49.95. But as soon as you buy 3 licences, price per licence drops to $26.65. What’s unique is, that you are able to buy an add on – life time upgrade. With life time upgrade price increases to $99.95 for a license. But you do get a lifetime license. If you prefer, you can stick with regular license and upgrade to a new version when ever you want. In case you buy at least 3 lifetime licences, price per license drops to $56.65. That means that you will be able to upgrade to the latest version for a very long time for 3 clients. I love eM Client, I like the fact that it is very similar to Outlook, not only with the similar look and feel but also with the features. Most importantly it is very affordable in some cases surpasses Outlook with features. 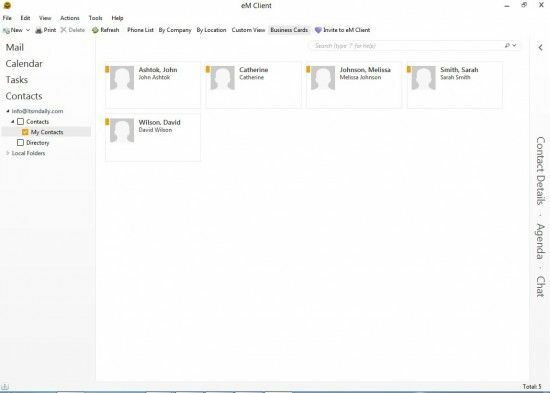 eM Client is Outlook alternative with exchange support, the best alternative in fact. Give Best email client for Windows eM Client a try, you can find yourself making a switch.